Hendrick ALBERTS (1613 – 1649) was Alex’s 10th Grandfather; one of 2,048 in this generation of the Shaw line. Hendrick Alberts was born 1613 in London, England. He married Geertruyd Andrissen Van DOESBURGH in 1640 in Holland, Reusel-de Mierden, Noord-Brabant, Netherlands. They emigrated in 1642. The Den Houttuyn left Texel Holland 6 Jun 1642 and arrived New Amsterdam 11 Aug 1642. Geertruyd’s younger brother Hendrick accompanied the couple on the trip. Hendrick died 1649 in Albany, NY. Geertruyd Andrissen (Geertruijt Dries) Van Doesburgh (Doesbruch) was born 1619 in Doesburg, Gelderland, Netherlands. Her parents were NOT Andries LUYCASZEN and Jannetje SEBYNS (See discussion below). After Hendrick died, she married Jacob Janszen Stol and had one child, Jan Jacobsen Stol, born 1658, Esopus, NY. Finally, after Jan did, she married Aard Martenz Dooren in Oct 1659. Geertruyd died 1679 in Kingston, NY. Jacob Janszen Stol was born 1610 in Holland and died in Oct 1659 in Esopus, NY. Aard Martenz Dooren was born in Well, Glederland, Netherlands. Many sources show Geertruyd’s parents to be Andries Luycaszen and Jannetje Sebyns. However Andries was from Fredrickstad, Ostfold, Norway, not Doesburgh. His first son, Jan Andriesen was born in Fredrickstad in 1625. It seems unlikely that they were Geertruyd’s parents. Gertruy Andriesen the real daughter of Andries Luycaszen and Jannetje Sebyns. The Den Houttuyn left Texel Holland 6 Jun 1642 and arrived New Amsterdam 11 Aug 1642. Kiliaen van Rensselaer wrote the names in a memo to Domine Johannes Megapolensis dated 3 June 1642. Engeltje’s husband Frederick Pietersen Mouritz was born 1641 in Ulster, Ulster, New York. His parents were Pieter Maurits and [__?__]. Frederick died 30 May 1709 in New York City, Kings, New York. Transciption of a portion: My wife E (Engeltie) shall possess and remain in possession of my whole Estate during her life, on condition that if she should marry it shall go to my heirs named below. My eldest son P (Pieter) 30 schepels of winter wheat, his right of primogenitur. To my 7 children, P (Pieter), J (Jannetie), M(Mourits) E(Engeltie), O(Oeyke), G(Geertruy) and E(Elisabeth) my entire Estate to be equally divided among them with the exception of the schepels of wheat given to P (Pieter). Wife appointed Executrix. Signed by the Testator. Hendrick Boggart (his mark), Jans Middagh, Joris Middagh, William Nottingham appeared before the Court on 5/30/1709 prooving the Will. 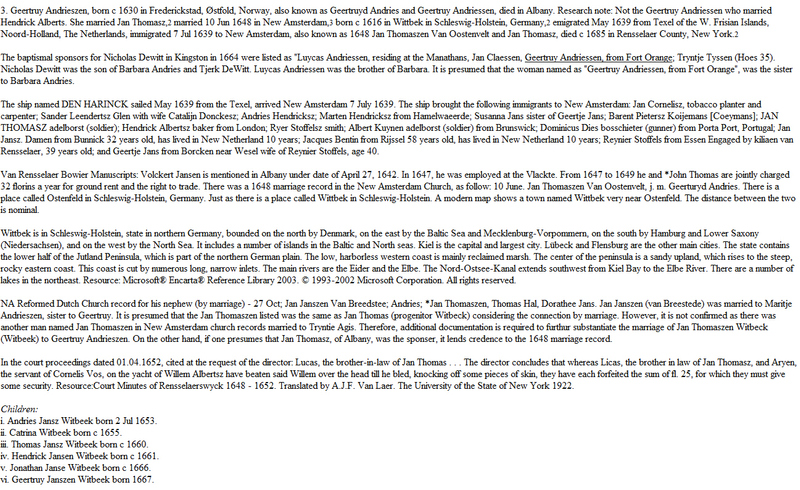 This entry was posted in 12th Generation, Immigrant - Continent, Line - Shaw and tagged Albany Pioneer, Den Houttuyn - 1642. Bookmark the permalink.